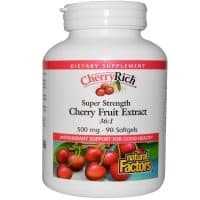 CherryRich is a highly concentrated extract rich in special compounds that provide antioxidant support for good health. Research has shown that cherry fruit may support joint structures and uric acid metabolism. CherryRich extract is made from 100% non-GMO fresh Bing cherries. All Natural Factors products are manufactured in accordance with the Government of Canada’s Good Manufacturing Practices (GMP), among the highest standards in the world. 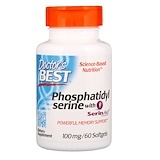 1 softgel 2-3 times per day or as directed by a health professional. Organic extra virgin olive oil, organic flaxseed oil, softgel capsule (gelatin, glycerin, purified water), sunflower lecithin (non-GMO), yellow beeswax, soy lecithin, medium chain triglycerides (coconut oil). Contains no artificial preservatives, color or sweeteners; no dairy, gluten, wheat or yeast.